URDC Volunteer Service Days are special days sponsored by URDC congregations and local churches where church members and others in the community spend a few hours helping low-income and elderly homeowners with indoor repairs such as painting, sheet rock, cleaning, woodwork, plumbing, and gardening. The day gives volunteers the chance to personally make a difference to improve the safety, health, and quality of the lives of those in the community needing assistance. A typical URDC volunteer day runs from 8:00 AM to 3:00 PM, and volunteers can participate for as many or few hours as they like. No special skills are needed and lunch is provided. The days are generally scheduled between May and October. 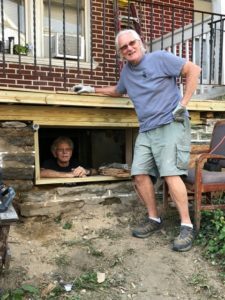 URDC sponsored its first volunteer day in 2013 in memory of Marion Taylor, a member of First United Methodist Church of Germantown (FUMCOG) and long-time URDC staff member, who died suddenly in 2013. 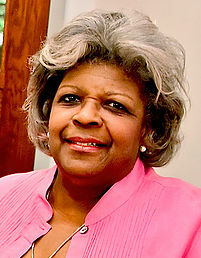 As URDC’s Housing Coordinator, Marion’s hard work, persistence, and advocacy helped thousands of low-income and senior residents in Germantown and Mt. Airy. Since 2013, FUMCOG honors Marion’s commitment to the community by sponsoring an annual volunteer day in her honor. 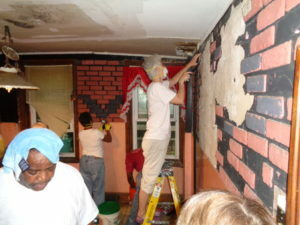 A number of URDC congregations and Philadelphia area churches have made a difference in northwest Philadelphia by sponsoring URDC volunteer days, including First Presbyterian Church in Springfield (Flourtown), Abington Presbyterian Church, Glenside United Church of Christ, and Mishkan Shalom. If you or your congregation wishes to join URDC to build a better Germantown, please fill out the form below.